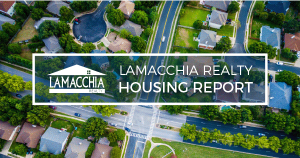 The Lamacchia Housing Report presents overall home sale statistics and highlights the average sale prices for single-family homes, condominiums, and multi-family homes in Massachusetts and New Hampshire for June 2015 compared to June 2014. Overall home sales in Massachusetts were up over 12% compared to June 2014. There were a total of 9,959 homes sold in June 2015 compared to 8,846 in 2014. This is the first month of increased home sales since February. It is the best proof yet that the log jam created by the winter snow is finally working its way through. The snow caused home sales to be down for three straight months prior May, April, and March. The average price for all homes including Single Family, Condo’s and Multi’s remained almost exactly the same at $389,260 compared to $387,818 in June of 2015. Southern New Hampshire Home Sales up 25%! June was a breakout month for home sales in Southern New Hampshire (Cheshire, Rockingham and Hillsborough Counties) with 1,350 home sales compared to 1,088 home sales in June of 2014. Like in Massachusetts prices remained almost exactly the same when comparing June 2015 to 2014 with an average sale price of $257,717 compared to $258,601 in June of 2014. There were 12,798 homes listed for sale in Massachusetts MLSPIN in June 2015 compared to 11,407 in June 2014. This is a 12% increase and is welcomed news for buyers as they now have more homes to choose from. Inventory of homes for sale has finally increased to a level that gives buyers more choices. Even though all Pending homes sales do not close it is still the best indicator of what is to come for home sales. There were 11,372 homes that went pending in June 2015 in MLSPIN compared to 9,590 in June 2014 which is roughly an 18% increase. This indicates the market is slowly but surely making up for lost ground from this past winter. It is evident home sales will increase dramatically this June and July compared to June and July of 2014. Demand among buyers continues to be steady and we expect the entire summer to be very strong for home sales. Data provided by Warren Group & MLS PIN and compared to prior year.